This tutorial will show you step by step how to extract audio from video in a few different ways using free software and an online audio converter. You can extract audio (e.g., MP3, WMA, WAV, FLAC, etc.) from any video (e.g., MP4, AVI, MKV, MOV, WMV, MPG, etc.). 2. Click on Media and choose Convert/Save. An Open Media window will appear. 7. Click on the Convert/Save button located at the bottom. 8. At Profile, you select an audio format (e.g., MP3, FLAC or Vorbis (OGG)). 9. Click on the Edit selected profile (tools) button. A Profile edition window will appear. 10. Make sure that the correct audio encapsulation (e.g., MP3, FLAC or Ogg/Ogm) is selected in the Encapsulation tab. This setting depends on the audio format you've selected at step 8. 11. Click on the Audio codec tab. 12. 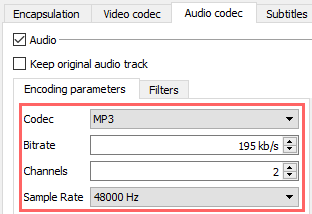 At Codec, you make sure that the correct codec (e.g., MP3, FLAC or Vorbis) is selected. 13. At Bitrate, you should select the same bit rate as the bit rate of your video. 14. At Channels, you select the same amount of channels as your video has. 15. At Sample Rate, you should select the same sample rate as the sample rate of your video. 16. Click on the Save button. Now you will be brought back to the Convert window. 17. At Destination, you click on the Browse button. 18. Select a location on your computer where you want to save the audio file. 19. At File name, you enter a name for the audio file ending with the audio file extension (e.g., audio.mp3, audio.flac or audio.ogg). 20. Click on the Save button. 21. Click on the Start button located at the bottom. VLC media player will now extract the audio from your video. Note: First you will need to install Audacity on your computer and then install LAME MP3 Library and FFmpeg. 2. Click on the LAME download link (e.g., Lame_v3.99.3_for_Windows.exe). 3. Save the file anywhere on your computer. Don't close the https://lame.buanzo.org/#lamewindl page. 4. Double-click on the installer file (e.g., Lame_v3.99.3_for_Windows.exe). 5. Follow the setup instructions to install LAME on your computer. 6. Go back to the https://lame.buanzo.org/#lamewindl page. 7. Click on the FFmpeg download link (e.g., ffmpeg-win-2.2.2.exe). 8. Save the file anywhere on your computer. 9. Double-click on the installer file (e.g., ffmpeg-win-2.2.2.exe). 10. Follow the setup instructions to install LAME on your computer. 2. Click on File and choose Open. Audacity will now import your video file. 6. 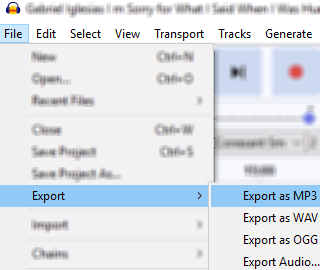 When Audacity is finished importing your video file, you click on File, go to Export and choose an audio format (e.g., Export as MP3, Export as WAV, etc.). An Export Audio windows will appear. 7. Select a location on your computer where you want to save the audio file. 8. At File name, you enter a name for the audio file ending with .mp3 (e.g., audio.mp3). 9. At Bit Rate Mode, you select Constant. 10. At Quality, you should select the same bit rate as the bitrate of your video (e.g., 192 kbps). Or if the same bitrate is not available in the selection menu, then select a bit rate that comes close to it. Like for example, if the audio bit rate of your video is 195kbps, then choose 192kbps. 11. At Channel Mode, you select Stereo. 12. Click on the Save button. 13. If the Edit Metadata Tags window appears, you just click on the OK button. Audacity will now extract the audio from your video. 2. At Version, you make sure that the top version is selected (highlighted). 3. At Architecture, you select the Windows version you have installed on your PC (Windows 32-bit or Windows 64-bit). 4. At Linking, you make sure that Static is selected (highlighted). 5. Click on the Download Build button. 6. After the download is finished, you will need to unzip the ffmpeg.zip file (e.g., ffmpeg-20171123-a60b242-win64-static.zip). You can use the free file archiver 7-zip for unzipping the file. After you unzip the ffmpeg.zip file, you will have a folder named something like ffmpeg-20171123-a60b242-win64-static. 7. Rename the folder to ffmpeg. 8. Copy or drag the ffmpeg folder to the (C:) drive (same drive as where Windows is installed). (C:) is usually the drive where Windows is installed and where you can find the Windows, Program Files and Program Files (x86) folders. 1. 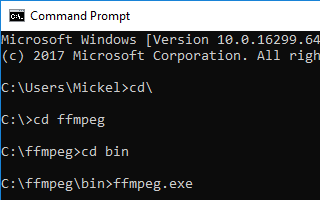 Copy your video into the bin folder of FFmpeg (e.g., (C:) > ffmpeg > bin). If you copy the video file into the bin folder, then you don't have to enter the full path to your video file, but only something like video.mp4 or video.mkv. 2. Open Windows Command Prompt. If you see something like the following lines, then it means FFmpeg is working fine and ready to use. -i is the path to your video file. If your video file name and format is different, then replace video.mp4 with the correct video filename and format (e.g., video.avi or video.mkv). -f mp3 tells FFmpeg that the output audio file must be in MP3 format. -ab 192000 tells FFmpeg that you want the output to be encoded at 192Kbps. You should type the same bit rate as the bitrate of your video. (e.g., 195000, 256000, 320000, etc.). -vn tells FFmpeg that you don't want video. The last one (audio.mp3 in this example) is the name of the output audio file (e.g., audio.mp3 or music.mp3). If you only type the filename and not the full path to where you want to save the audio file, then FFmpeg will save the audio file in the bin folder. FFmpeg will now extract the audio from your video. Note: The maximum file size of a video you can open in Online Audio Converter is 2048 MB. 2. Click on the Open files button. Online Audio Converter will now upload your video. The time it takes depends on the file size of your video and the speed of your internet connection. 6. Select an audio format (e.g., MP3, WAV, FLAC, etc.). 7. Click on Advanced settings. 8. At Bitrate, you should select the same bit rate as the bit rate of your video. Or if the exact same bitrate is not available in the selection menu, then select a bit rate that comes close to it. Like for example, if the audio bitrate of your video is 195kbps, then choose 192kbps. 9. At Sample rate, you should select the same sample rate as the sample rate of your video. Or if the exact same sample rate is not available in the selection menu, then select a sample rate that comes close to it. 10. At Channels, you select the same amount of channels as your video has. 11. When the video is finished uploading and you're done with the settings, you click on the Convert button located at the bottom. Online Audio Converter will now convert your video file to an audio file. 12. When your video is converted, you click on the Download button. Your audio file will now be downloaded and saved on your computer. 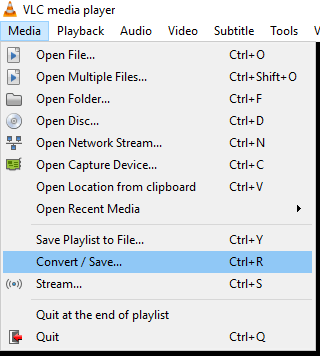 Depending on your browser settings, you might need to select a location on your computer (where you want to save the audio file) and then click on the Save button.